Providing information to youth is critical to their safety and the success of the Safe Place program. Youth need to know there are ways to get help and alternatives to running away. They need to know that there is a “safe place” to go when they need help. Talking to them face-to-face is the most effective way to reach young people. This not only gives them access to information about how Safe Place works, but gives them a chance to ask questions about the process. When adults share information about Safe Place, it lets youth know that “it’s ok” to use the program when they need help. Showing support of Safe Place plays a vital role in the youth’s comfort level in accessing help without fear of “getting in trouble”. Share the following information with youth – those in your own home, the homes of friends and family, your children’s friends, and the young person down the street or down the hall. Discuss common dangers and the importance of safety. 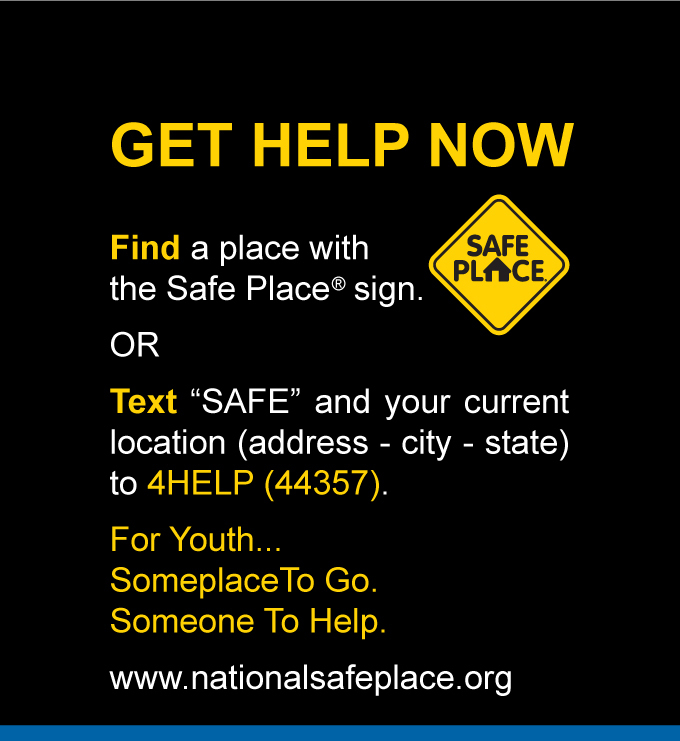 Safe Place is a national youth outreach and prevention program for young people in need of immediate help and safety. A teen can enter any location with this sign to access help and safety. When they enter, they should tell a staff person they saw the Safe Place sign and need help. The trained staff person will assist them. Learn more about how Safe Place works here. Share how to locate a Safe Place. Visit the “Locate a Safe Place” directory to practice locating the Safe Place nearest your current location. Look for the sign at designated businesses and other public buildings, and transit vehicles. Share information about TXT 4 HELP – created to reach youth wherever they are, whenever they need help. Learn more by taking a look at the TXT 4 HELP FAQs. Save the number, 4HELP (44537), in their phone and practice with the young person. Let them know it’s ok to get help. Some young people are afraid to get help through available resources in fear of getting in trouble. Every young person needs help at some point and they don’t always go to a parent or guardian. Help ensure their safety by teaching them Safe Place is a trusted source. If the young person still has questions about Safe Place, share the Teen FAQs with them.